Following on from the success of Dundee’s first Global Service Jam in March 2013, The (Ser)Vice Squad was established to maintain some of the buzz from the Jam. Dundee’s inaugural Jam was the 8th largest in the world this year, which is representative of the strength of interest in creative events in the city and, more specifically, of the growing interest in service design. We hoped that the event would provide an opportunity for those who attended the jam to continue to expand their connections and to enable those who were unable to commit an entire weekend to a design event the chance to take part in some light-hearted activities and learn some new service design methods. You can visit the Storify page documenting the tweets and images from the event. What does Service Design mean to you? “Widening perspectives, opening doors, creating new ways forward for positive social transformation”. “A means of doing things better, using design to effect real change for real people – it just makes sense”. “Creating and problem-solving with users in mind”. “Connecting people and experiences to solve life’s issues”. The common threads that arose from the numerous definitions that we collected were that attendees were interested in service design as a way, not only of addressing the problems of today, but of anticipating the problems of tomorrow and as a way of putting people at the centre of the design process, connecting users, stakeholders and wider society to improve people’s experiences through a holistic approach. Participants were also interested in the power of design tools to encourage people to collaborate and think differently, coming up with solutions that might not readily be apparent. We also asked attendees what they hoped to achieve from participating in the mixer, and their answers were very much in sync with their definitions of the value of service design. The most common answers given were the desire to learn futurecasting and knowledge exchange techniques, to acquire new tools that would encourage thinking differently and approaching problems from new angles as well as having the opportunity to collaborate with interesting individuals and catch up with creative individuals they may I have met at other events. After spending some time mingling, attendees formed groups and were set the challenge of coming up with a service inspired by two items chosen at random. The pairs of items selected included a globe and a screwdriver; a lemon and an alarm clock; a high-heeled shoe and a robot, to name a few. After having 30 minutes to discuss, outline and potentially prototype an idea teams presented their services which included a dating service and a service that monitored and subsequently communicated changes in your health to designated friends and family members. The challenge was designed to give attendees the opportunity to form stronger relationships and have more meaningful interactions through working together on a shared task, as opposed to merely chatting for a while and swapping business cards. The intensive, 30 minute nature of the task, requires an all-hands-on-deck approach, that involves all participants and enables everyone to take part in the design process. The random selection of some quite surreal objects also inspires participants to let their imaginations run wild and not be restricted by more pragmatic concerns during the ideation process, as well as giving them a break from more boring problem-solving tasks that might fill their work week. One of the recurring themes in the feedback given by attendees when asked what they hoped to gain from attending the mixer and what they would like to see from future (Ser)Vice Squad events, was a desire to undertake activities that could have real-world impact. For example, some participants suggested picking a local issue to be the focus of a future event. The skills of creative, divergent thinking and the questioning of assumptions encouraged by many service design tools can be truly inspiring, particularly when intensive events such as the 30 minute service design challenge undertaken at the mixer highlight how much diverse groups of individuals using these tools can achieve in such short periods of time. Both the 30 minute service design challenge and the activities undertaken at the Dundee Service Jam focus largely on the initial ideation process and the first steps towards fleshing out an idea through prototyping and seeking feedback. 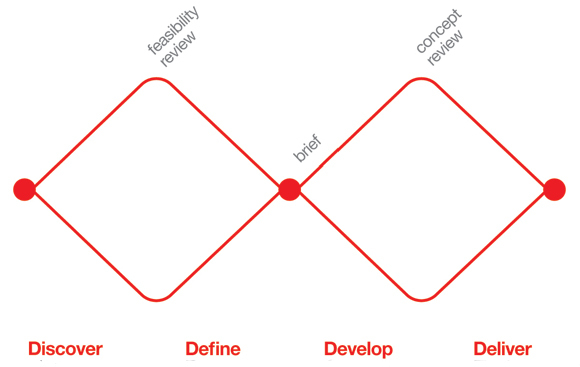 In most cases participants in these exercises only effectively engage with the first stage of the Double Diamond Design Process, as described by the Design Council UK (see figure below). As stated by Global Service Jam Co-Founder, Adam St John, “You don’t go to a [musicians’] Jam to record an album”. It is the spirit of exploration, of musicians coming together to have fun without being restrained by focusing on the end product and of the need for a space away from the usual results-focused work, that inspired the Global Service Jam. However there appears to be a need, particularly in light of the suggestions given by attendees of The (Ser)Vice Squad for future events, for a platform that somehow enables participants to learn new ways of encouraging divergent, expansive thinking to apply to the design of services as well as the opportunity to develop and crucially deliver service ideas that have a real-world impact. There is no readily apparent way to reconcile the need for a fun, informal event that provides a creative space to make new contacts away from usual work and project demands and a more focused event that aims to catalyse real world change. If some of the conversations I have had in the wake of the Global Service Jam this year are any indication, there certainly seems to be a growing interest in adopting the vibrant, ‘anything goes’ approach of exploratory design events with a desire to catalyse concrete service/initiative development There is no easy answer to this as, arguably, the reason that these type of fun events are so successful in invigorating and inspiring participants and teaching new ways of working is because they are not focused on the end result, much like a musician’s jam session. Balancing this fun approach with activities that can catalyse real impact will certainly be something that we keep in mind during the planning of future events. While it may be difficult to directly encourage the development of services that can have real-world applications during the few hours that a mixer lasts, we certainly hope that the initial ideas and relationships that are born of The (Ser)Vice Squad events may well yield results in the form of future projects and that a wide array of service design methods that support different elements of the design process can be used at different mixer events, enabling regular attendees to build up a diverse ‘toolkit’ for use in their future projects. With The (Ser)Vice Squad planned to be a regular, reoccurring event there may be the opportunity to use the mixers as a way of supporting the development and delivery of services by attendees by focussing different events on different stages of the Double Diamond model so that community leaders, project managers, entrepreneurs and others can tap into the mixers as part of a support system during the development of their service. We are hoping that the mixer will become a popular addition to the calendar of local events and will take place quarterly, with the next event due to take place in late June 2013. As stated during the mixer, it is our aim that everyone who is interested feels able to contribute and we are keen to hear from potential collaborators if you have an idea or a theme for a future mixer. Miscits have already signed up to run an event one month (did we not mention that the feedback form functioned as a legally binding agreement?). Please get in touch via the comments below or join our Facebook group to get involved.